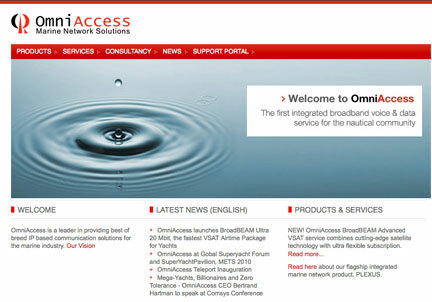 [SatNews] VT iDirect, Inc. (iDirect), a company of VT Systems, Inc. (VT Systems), has announced that OmniAccess S.L. has launched BroadBEAM Ultra, the latest addition to its line of maritime VSAT broadband services. The service is based on iDirect’s next-generation DVB-S2 Evolution platform, leveraging its maximum efficiency gains to offer unparalleled single-link speeds to yachting customers across the Caribbean and Mediterranean. iDirect is a world leader in satellite-based IP communications technology. OmniAccess’ BroadBEAM Ultra service is designed to meet the demands of super- and mega-yacht owners who are increasing their usage of next-generation, bandwidth-hungry applications such as IPTV streaming and HD video conferencing. While previous service standards usually peaked at 1-2 Mbps, BroadBEAM Ultra is engineered to be up to 20 times faster, setting a new standard as the fastest single-link maritime VSAT service available today. The service will be offered in tailored packages optimized for the yachting calendar – a 5-month, winter-season package for the Caribbean and a 6-month, summer-season package for the Mediterranean. The new service is powered by iDirect’s Evolution platform, providing maximum efficiency gains and flexibility that enable OmniAccess to deliver high-speed satellite broadband at competitive fees. Earlier this year, OmniAccess migrated its customer base to iDirect’s next-generation platform by installing Evolution X5 satellite routers onboard their vessels. With the X5’s built-in support for high-speed, high-efficiency applications, customers can seamlessly upgrade to OmniAccess’ latest service offering without needing to purchase new hardware. Evolution is based on iDirect’s Deterministic Time Division Multiple Access (D-TDMA) technology, enabling OmniAccess to flexibly support groups of yachting customers with shared bandwidth pools. By sharing capacity based on real-time demand, OmniAccess can avoid expensive, dedicated satellite links while ensuring that it meets each customer’s SLA. Further, advanced Group Quality of Service (GQoS) controls allow OmniAccess to intelligently allocate and prioritize bandwidth based on the specific needs of each vessel, and even among each application onboard.